Damage to a level crossing barrier is causing delays on the Metro travelling between South Hylton to the airport. A vehicle is believed to have driven over the crossing on Tile Shed Lane, East Boldon, and damaged the barrier. The car then left the scene and police inquries are ongoing. There are currently delays of up to 20 minutes as trains are operating at a reduced speed in the East Boldon area. A Northumbria Police spokesperson said: "At 8.38am today, police received a report of damage to a level crossing on Tile Shed Lane, East Boldon. "It was reported that a vehicle had driven over the crossing and caused damage to the barrier, before leaving the scene. Nobody was injured, but inquiries are ongoing to determine the circumstances surrounding the incident. "Officers are at the scene and motorists are advised there may be congestion in the area." It's the second time the crossing has been damaged by vehicles for the second time this month. A train collided with a white BMW at the level crossing in Tile Shed Lane, Boldon, shortly before 10pm on March 7. British Transport Police attended the incident and it is not believed anyone has been seriously hurt. 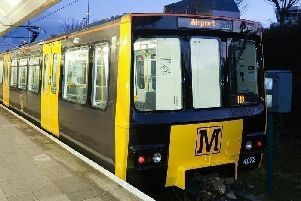 Tyne and Wear Metro said: "There are delays of up to 20 minutes to trains running between South Hylton and Airport due to a police incident at the Tile Shed level crossing at East Boldon. "Trains are running to all destinations however we are operating at a reduced speed in the East Boldon area."